to become the last one standing. put you at the heart of battle. DURING THE EVENT PERIOD COMPLETE BOTH PARTS OF THE 'PLAY' EVENT TO BE AUTOMATICALLY ELIGIBLE FOR REWARDS. Right-click to open and receive all of the following items. Post or share a fun video clip of Shadow Arena on your Facebook/Twitter account! Post an original video, or share someone else's video on Facebook/Twitter. The video needs to show the Shadow Arena in Black Desert Online. the region of your account (NA or EU), and your in-game Family Name. Your rewards for Event 1 and Event 2 will be sent to your in-game mailbox (B) during the regular maintenance on Feb. 20th, 2019. 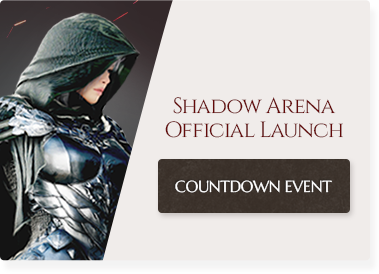 Event 1 will also take into consideration your Shadow Arena participation before the event period. This means that the number of matches you played as well as the number of adventurers you defeated in Shadow Arena from Jan. 16th, 2019 (after maintenance) - Feb. 13th, 2019 (before maintenance) will count towards Event 1. You can check your Shadow Arena stats in the UI on the top-left corner while you are at the lobby of Shadow Arena..
Posts or shares for Event 2 deemed to be profane, vulgar, or lascivious by our internal review process may result in the restriction of your game account.